FORT PIERCE — Members of the Fort Pierce Police Department and St. Lucie County Sheriff’s Office raised $1,624 for Special Olympics during Tip-A-Cop at Applebee’s in Fort Pierce on April 21. Tip-A-Cop is an annual fundraising event organized by The Law Enforcement Torch Run for Special Olympics, where law enforcement officers volunteer their time as “celebrity waiters” in restaurants and receive tips to raise funds for Special Olympics, the world’s largest sports organization for people with intellectual disabilities. 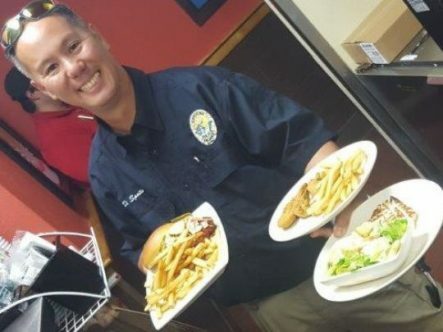 Local law enforcement officials from the St. Lucie County Sheriff’s Office and the Fort Pierce Police Department served as “celebrity waiters” at Applebee’s, earning $1,624 in tips, which were donated directly to the Special Olympics. 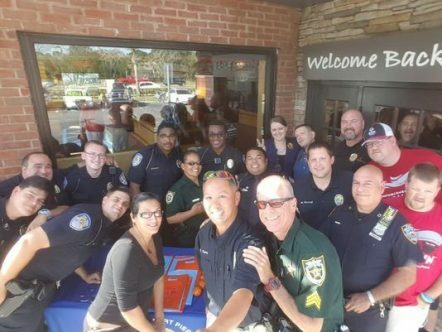 Volunteers from the St. Lucie County Sheriff’s Office and the Fort Pierce Police Department pose during their April 21 shift at the Fort Pierce Applebee’s, where they served as “celebrity waiters” during a Tip-A-Cop fundraiser to benefit the Special Olympics of Florida. The law enforcement officials raised $1,624 in tips, which were donated directly to the Special Olympics, which provides year-round sports training and competition for children and adults with intellectual disabilities or closely related developmental disabilities.